If you cannot be attended in our centres, or you require glasses with Palomar´s prisms for a patient with right homonymous hemianopia, we offer you the possibility to order it, filling out the following questionnaire. Once we valued all the data, we will contact you. 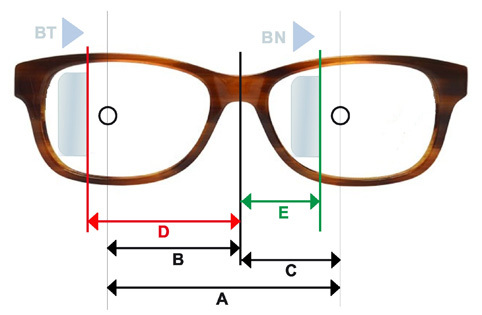 INTER-PUPILLARY BINOCULAR DISTANCE (A) mm. NASO-PUPILLARY DISTANCE RE (B) mm. NASO-PUPILLARY DISTANCE LE (C) mm. ON HAVING REALIZED THE ORDER YOU HAVE TO BE RESPONSIBLE THAT THE CONTRIBUTED INFORMATION WILL BE REAL, ANY MISTAKE IN THEM AND ITS CONSEQUENCES WILL BE YOUR RESPONSIBILITY, NOT ADMITTING ANY CLAIM FOR IT. WE REQUEST YOU TO CHECK WITH THE MAXIMUM ATTENTION ALL THE INFORMATION INTRODUCED IN ORDER TO AVOID ANY MISTAKES.